Tumours in dogs could be of different types, but canine mammary tumours represent 50 percent of all canine tumours and it’s the most common among female dogs. However, this dreaded disease occurring primarily in older dogs is curable. Here’s more on the causes, symptoms, diagnosis and treatment. What is canine mammary tumour? Canine mammary gland tumour (MGT) is one of the most common diseases among the older female dogs who are not spayed. This tumour is hormone dependent disease and its risk factor is just 0.5 percent for those female dogs being sprayed before their first estrous cycle, eight percent for those spayed after one estrous cycle and 26 percent for those spayed after two or more cycles. Canine mammary tumours are generally developed in the caudal mammary glands of the pets. Sporting breeds like Pointers, Retrievers, English Setters and Spaniels as well as others including Poodles, Boston Terriers and Dachshunds are prone to canine mammary tumours. Around 50 percent of canine mammary tumours are benign (mild). The tumours could be of singular or multiple occurring in any of the glands. But there are chances of both malignant (serious) and benign canine tumours occur simultaneously. Both tumour types can occur as firm, well-demarcated lesions, so it is impossible to distinguish malignant from benign lesions by appearance. Bleeding and infection of the mammary tumours are reported in rare cases. Certain symptoms like rapid growth, local tissue invasion and ulceration are usually hallmarks of malignant tumours. Tumour size is probably the best prognostic indicator. But factors such as age of the patient, tumour numbers and tumour locations have less prognostic value. No specific clinical signs would be visible to prove the presence of canine mammary tumours except stumbling upon a lump while petting the dog. There will be firm nodules (lumps) palpable in the mammary chain or gland. And the surrounding tissues may be involved, which in turn results in the lymph nodes in the area that may also be enlarged. Spreading of the tumours in other body glands may cause some complications including: loss of appetite, weight loss, lethargy, etc. Physical examinations would be the primary basis for diagnosis of MGT. The malignant tumours could be cured only with surgery, but CBC, serum chemistries and thoracic radiographs should be evaluated before surgery. Evaluation of a biopsy is an important aspect for diagnosis of MGT. There are certain tests including X-ray of the thorax and abdomen, abdominal ultrasound, biopsy of lymph nodes, blood examination, etc to find out the spread of the tumours. Any accepted methods of surgical removal of the tumours may be used. The vet should choose the simplest procedure to remove the entire tumours. Chemotherapy may have minimal anti-tumour activity, but adjunct chemotherapy may be used together with surgery, since the tumour can occur even after complete removal. But the following factors should be considered to decide to treat the patient with chemotherapy along with the surgery: i) size of the tumours, ii) whether the site of tumours is ulcerated or not iii) spreading of tumours in others body organs and vi) microscopic examination of the tumours’ characteristics. The role of chemotherapy in dogs with malignant mammary tumours has not been defined. Chemotherapy is theoretically indicated in some dogs with malignant mammary tumours (due to the high metastatic potential of these tumours), but objective studies have not been published to support this recommendation. For most mammary tumours in dogs, hormonal therapy, immunotherapy, and radiation therapy have either not been investigated or beneficial. Surgery is not recommended for dogs with inflammatory mammary carcinoma because it does not improve survival rate. Unfortunately, an effective treatment has not been discovered. Radiation therapy in combination with a non-steroidal anti-inflammatory drug has been shown to provide the most effective palliation in dogs with inflammatory mammary carcinoma, but the prognosis remains poor. Veterinarian cannot distinguish benign tumours from the malignant ones without biopsies. So, surgery removal of the tumours is advisable for all mammary tumours followed by histology. 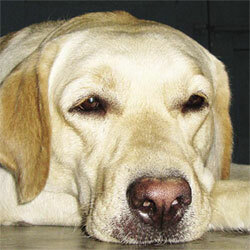 Tumour size of more than three cm in dogs is considered malignant. Chemotherapy is not curative in malignant tumours. Though ovariohysterectomy has not been proved to increase survival, it is recommended because 50-60 percent of canine mammary tumours have estrogen receptors on their cells that may increase the recurrence of tumours. It should be kept in mind that the female dogs spayed before their first estrus cycle are safe from canine mammary tumours. (Dr M Chandrasekar is Associate Professor at the Department of Veterinary Medicine, Ethics and Jurisprudence, Madras Veterinary College, Chennai).